Hi James, I just wanted to write and say thank you so much for what was incredible activity on Saturday. The girls had such a brilliant time and it was exactly what we wanted. The canapes were fabulous and all the girls have commented on how brilliantly you organised us all! You have such a wonderful business and we wish you well! 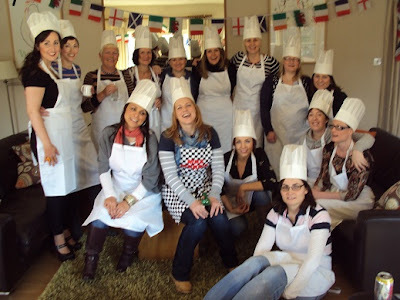 We will all be recommending you to friends of ours as it was such a perfect event for a hen party. The bride to be loved it! The 'before' team shot - Let's go! "Suprise!.... Today we're all doing a cookery lesson"
"Ooh - I love an assertive man!....." Oh yeah - you've got to love hen parties! Somehow the hen's friend who had organised the whole weekend had managed to keep this part of it a secret - to everyone. They'd all paid for something, just didn't know what. Once again we were crossing The Apprentice with Hell's Kitchen - a cookery event is good, but it's so much more fun when you're competing against your friends. In this case there was a welsh team and an english team. After a few demonstrations from me of techniques they would find useful it was over to the team captains to organise their teams. It may look daunting at the beginning, but actually - as they quickly found - when you split your group up into sub groups which take on one canapé each, actually it's quite straight forward - and rather enjoyable. As always they had their trusty recipe booklet with all the info and I was going round everyone to give a bit of help, support & tips. Making smoked salmon rosettes to go on rosti & cutting brie for risotto balls - eyes down! When you run out of space in one kitchen you overflow into the next kitchen. Making asparagus puree here. Yorkshire puddings fresh from the oven - haven't they risen well! Seasoning sushi rice - vitally important you taste it! Their's tasted great! And when you run out of space in both kitchens you spill over into the dining room to make your sushi! We judge on presentation & taste. On the left was the english team - much more uniform round shape. But the seasoning of the rice of the welsh team (right) was much better - don't forget the seasoning dulls down as the rice cools, so it needs to be slighty more seasoned than you think it should to take account of this. This is why supermarket sushi tastes so awful - it's too old by the time you buy it. The carrot decorations got bonus points though! The hen with her beetroot rosti & smoked salmon. "Good enough to be on Ready Steady Cook!" I quipped. Actually she had been. "Ainsley Harriot!" 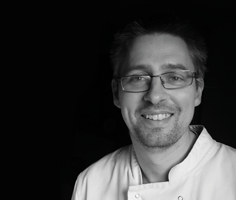 gushed the hen's mother "Such a lovely man - gave me a great big hug!" Everyone loves Ainsley! The english team on the left again, and the welsh on the right. Equal points on taste - it's just so good. But on presentation - maybe the english teams rosti could have been a bit more bite size - such a good effort & labour of love though! Great result from the welsh team! Any dip? Quick ransack of the fridge turns up some tomato salsa - great dip! The english team goes more rustic (above). What a great job on these - everyone's favourite canapé. The english team (left) went for a bite size canape version, while the welsh team went for a more rustic brunch size version. Who's right? Both are good! Slight overcooking on the beef though for the welsh team - not sure what my wedding guests would say if I served them like that - so I think the english team won through on the taste there - judging's a hard thing! Welsh team above and below right. English team below right. On this one both were as good each other! A national tie! Final results though as I added up the marks - the welsh team won by 5 points - hoorah! for Wales. And hoorah for all my canapé chefs and their wonderful creations - you all did a wonderful job! Amazing what you can do really - isn't it! The 'after' group team photo - cheers! "Seemed like a lot of faff at the beginning" said the hen afterwards "... but then you get going, and get into doing your own thing - and it's really quite easy and so worth it - it all tastes amazing!" Yay - fun time was had by all! PS - Thanks for choosing Wales as winners - always good to get one up on the old enemy! Well... 'choosing' had nothing to do with it - it's a fair & honest contest!